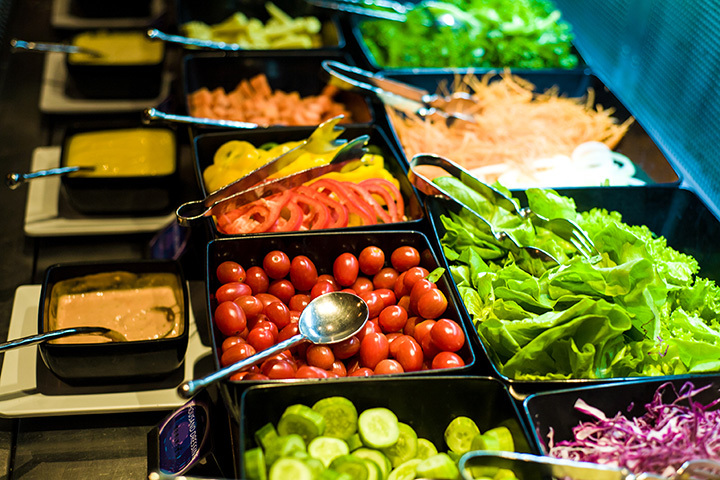 A salad bar offers itself as a lovely accompaniment to your entrée. Others are comprised of an enviable spread worthy of creating an entire meal. No matter which way you enjoy your salad bar, you’ll love the following places to indulge in one. They’re the best in Maine. Give one a try when you’re in the neighborhood. Warren’s Lobster House is known for its salad bar as much as it’s known for its fabulous seafood. Included with entrees or available to purchases solo as a meal, you’ll want to plan on bringing half your entrée home if going that route. The offerings are hearty and delicious. The salad bar even includes soup and delicious homemade rolls. The salad bar at the Bull and Claw is beloved by summer tourists in Maine. That means the best time to enjoy it is after the tourists have left. Featuring unlimited salad fixings, hearty add-ins, homemade soup and freshly baked rolls, you’ll find plenty to make a meal. And if you happen to be a tourist and can only visit in June or July—it’s well worth the wait you’ll likely encounter. The salad bar at Merry Auld Market & Tea Company is small, but well worth your time. Nowhere will you find fresher, crisper greens and vegetables—locally sourced when in season. The delicious dressings are a treat, as you’re sure to find one you’ve never tried. Stop in to pick up a few things at the market, but spend a few minutes creating lunch or dinner from their delightful salad bar. At Shelby’s Deli, the salad bar is for your viewing only. You choose which ingredients you’d like, and an employee will create the salad of your dreams. During the warmer months, the fixings come from nearby farms in Maine, but don’t think you should skip the rest of the year. Always fresh with multiple ingredients from which to choose, you’ll walk away with a delicious lunch or dinner from their salad bar. On the shores of Maine’s Moosehead Lake, Kelly’s Landing serves up a simply amazing salad bar. The croutons are said to be the best in the Pine Tree State. Choose from greens, sliced and chopped veggies, cheeses, pasta and more. The salad bar at Heritage House Restaurant is only available at lunch time but is akin to taking in a beautiful spread at Grandma’s farmhouse. You won’t see an industrial, chilled salad bar display, but instead will find homemade dressings, sliced and diced vegetables, greens and more—on a variety of plates and bowls, many from local farms when in season. You really must check this salad bar out! Not only is the Lincolnville General Store an event to visit, they also have a salad bar. Amidst the many fine gourmet accoutrements—olives oils, dipping oil for bread, a vast assortment of fine wines—sits a salad bar that’s beloved by locals and a pleasant surprise for visitors. Order one of their handmade pizzas to go and bring a delicious salad home to accompany it. As with so many Maine salad bars, the veggies come from local farms in season. The salad bar at DaVinci’s Eatery is almost as enticing as their amazing Italian fare. Available for both lunch and dinner, it’s the perfect accompaniment to a shared pizza and glass of wine. Or order some Bruschetta and enjoy it as a meal. The salad bar at Ocean Gardens Restaurant and Tavern includes their fresh, homemade soup. If you can pass up the delectable seafood—or are simply looking for something a bit lighter, this salad bar will fill you up, whether you enjoy it for lunch or for dinner.